A major report on the Physician-Scientist Workforce was presented and discussed at the most recent Advisory Council to the Director (ACD) meeting. It was a highly anticipated follow-up to the Biomedical Workforce report from a couple years earlier. I want to follow-up my earlier post with a closer look at some key points presented by the Physician-Scientist Workforce (PSW) working group. The PSW working group was asked to analyze the physician-scientist biomedical workforce, which is defined as scientists with professional degrees who have training in clinical care, and who are engaged in independent biomedical research – for example. MDs, MD-PhDs, nurse-scientists, dentist-scientists and vet-scientists. The working group was also asked to make recommendations for physician-scientist research training. 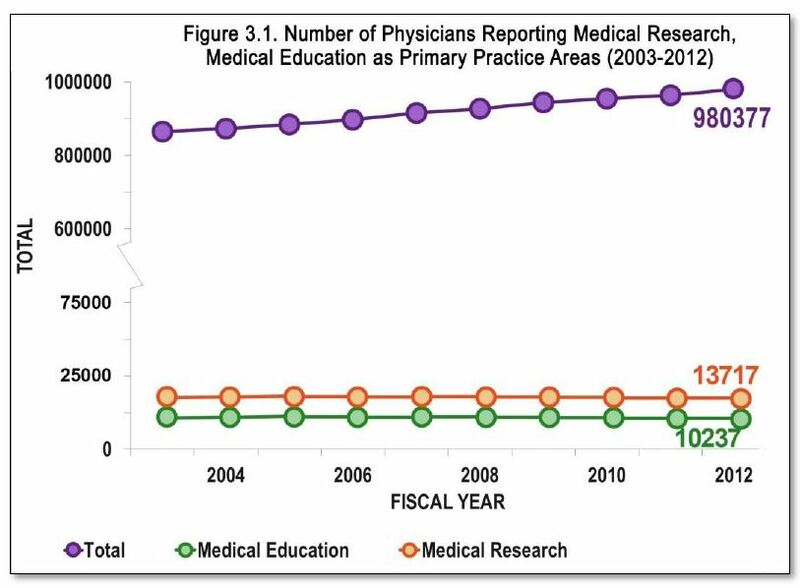 One major finding was that the number of physicians entering the research workforce remains virtually unchanged over the last decade, even though the total number of physicians increases. This means that physician-scientists make up an even smaller proportion of the medical doctors today, compared to a decade ago. Another interesting finding is that – similar to the overall biomedical research workforce – the physician-scientist workforce is aging. 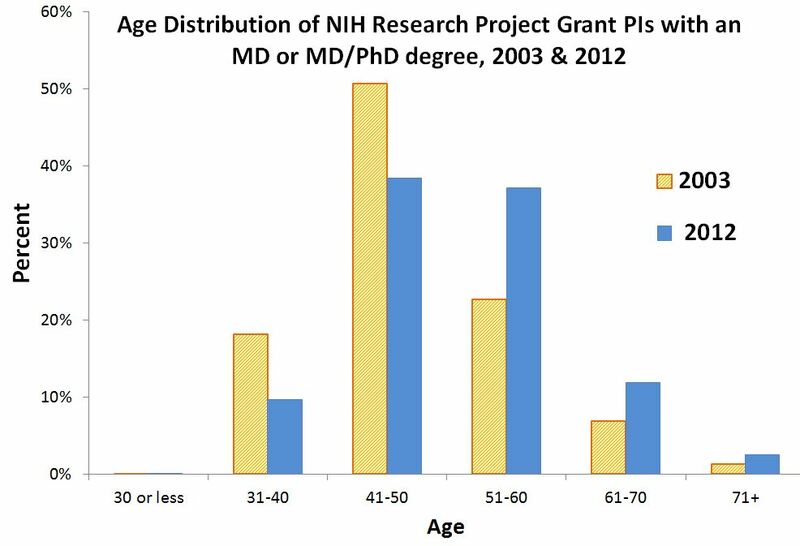 The figure below shows 2003 and 2012 data on the age distribution of NIH Research Project Grant (RPG) awardees with MDs or MD/PhD degrees, and demonstrates the age shift of the NIH-supported physician-scientist workforce. 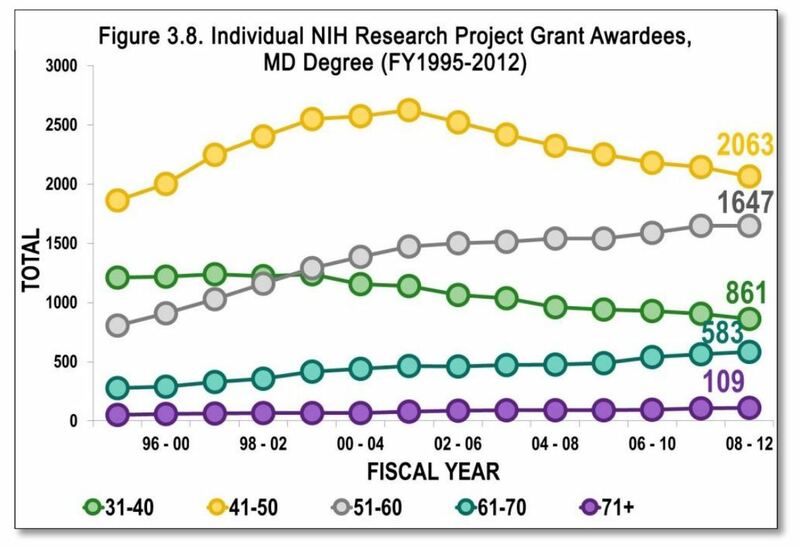 You can see that in 2003 the majority of NIH’s physician-scientists were under 50, but in 2012 the age distribution has shifted to the right, such that a little over 50% of NIH’s physician-scientist PIs are age 51 and over. 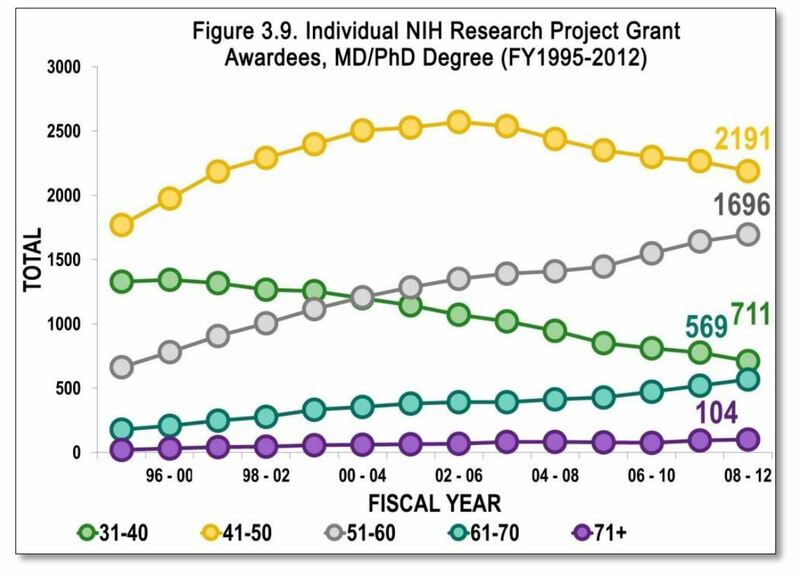 These two graphs from the PSW report show 1996 to 2012 data on the number of NIH research project grant awardees with either MD degrees (Figure 3.8) or MD and PhD degrees (Figure 3.9). Again, these data show the age shift of the workforce occurs for both MDs and MD/PhDs – the numbers of awardees in the youngest two cohorts have declined, while those in the 51- 60 and 61-70 cohorts have increased. These data, coupled with the data showing the declining proportion of physician-scientists, suggest that – as this trend continues and today’s physician-scientists exit the workforce – there won’t be replacements at the rate needed to sustain a robust physician-scientist workforce. Therefore, the working group developed recommendations to address this dilemma, and provide incentives to encourage physicians to join and sustain them in the research workforce. These recommendations – which you can read about in the final report – will be taken into consideration by NIH. The data above are just a tiny fraction of the bounty of interesting data produced by the Physician-Scientist Workforce working group and included in the report, so I encourage you to take a look. Also, check back in a few weeks when we will upload the raw data and graphs from the PSW working group to RePORT including breakouts of data on all types of physician-scientists, including nurse-scientists, dentist-scientists and vet-scientists. NIH will be discussing approaches to fostering the physician scientist workforce, so stay tuned for updates. This entry was posted in blog, Rock Talk and tagged ACD, Biomedical Workforce, Funding data, physician-scientist workforce by Sally Rockey. Bookmark the permalink. The numbers and statistics are quite eye openers for all of us and we should start implementing the recommendations of these two workgroups that formed the basis of final ACD report to NIH Director. There is critical need to get physician-scientists involved in proportionate numbers to basic scientists that would bring in holistic approach and comprehensive perspective to the every human disease related project studied and funded by all federal and non-federal funding agencies. Physician-scientists bring in unique perspective to a basic, behavioral or translational research project that would reduce duplication of unnecessary efforts, unintended consequences and streamline a more robust, well conceived design and execution of every aspect of the project. If we expect to have a profound impact of the currently funded research projects, physician-scientist ought to be the integral factor in the equation of moving ahead from bench to bedside and interventional research, the main imputus for the creation of NCATS, public-private partnership with trans-disciplinary team science approach at best! If NIH wants more clinician/scientists, then make sure they recruit MD/PhDs or MDs who have completed one or two research fellowships. Giving funds to MDs who have never done research is a waste of public funds. Take a look at MBBS folks who get grandfathered as MDs here in USA, or the Canadian MDs who also have had zero exposure to research. All they do is hire a senior PhD to run their newly minted lab, to train graduate students, to write papers, grants etc. All the while a PhD could have done a much better job at much lower cost. And, medical schools play into this love-fest with physician scientists by providing lab space, start-up funding as recruiting tools for MDs. True, there are some really stellar MDs doing research, running labs on their own, but these are the exception rather than the norm. Instead of marginalizing PhDs, NIH should promote strong research collaborations between MDs and PhDs 1] to ensure ready access to clinical samples and data to PhDs and 2] information from the PhD side to the MDs on potential clinical applications. Allow me to offer a “MD perspective” from someone who has completed basic science post-doctoral training as well as clinical residency. The major problem is that the best and brightest MD degree holders are impatient with the lack of proper respect and support from NIH. Many MD degree holders are not feeling the love that they truly deserve. There is no “love-fest with physician scientists” as you wrote. We constitute a very small (and diminishing) and invaluable resource. MD researchers know what is clinically important and what sorts of basic science projects will have a broad impact in improving human health. If you marginalize us, the system suffers. 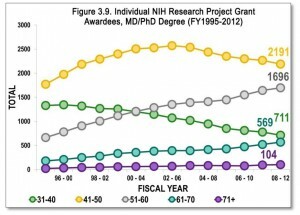 Why is NIH so enamored of MDs trying to research? There are some wonderful physician-scientists out there, but there are already a lot who don’t know what a control is, think that “collaboration” means putting their names on other people’s work, and seem to feel that the goal of the whole enterprise is to fatten one’s CV. I wish NIH worried more about the quality of the research than about the degrees held by the people doing it. Medical training brings a powerful perspective to basic science research that the majority of PhD trained scientists lack. By the same token, research training brings a perspective to medical research that trained physicians dont bring. It can go both directions. I strongly agree with the sentiment of PR’s comments. Why does the NIH push physician-scientists so strongly? I agree there are outstanding physician scientists..but there are just as many or more outstanding basic scientists..so why is there a bias to support the former? “Basic” Scientists have had much more training in experimental methodology. In my experience they have much more rigor in detailed research It seems there should be just as much emphasis on providing “Medical” training to basic scientists so they can learn more about disease as there is to support Physician scientists (other than those with PhDs) to perform research. This could be provided through enhanced support of programs to promote training of basic scientists for translational science. The stats always focus on the number of physician scientist…lets see the stats on impact, novelty and real contributions to moving fields forward to justify this focus. Agreed. 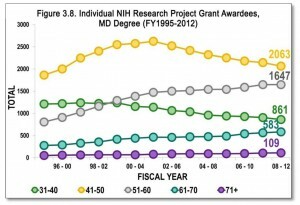 Why does NIH keep pushing for more MDs in research? We have a highly trained PhD workforce that already does this quite well. Lets see some NIH programs focussed on PhD scientists for a change. In my opinion, the NIH does not really push physician scientists enough. The comments here are typical. PhDs doing research related to human diseases think they understand the diseases. In truth, almost all PhDs are painting by the numbers and have none of the fundamental insight that comes from actually, seeing, thinking about, and living with human disease. The PhDs who dominate study sections and trash grants from MDs are really reflecting the attitudes expressed here–they don’t get it and they have no idea how clueless they are. Of course there are a lot of phony physician scientists out there, people with MDs but who seldom or never get near a patient. I certainly share your low opinion of this species. But, in the end, there are many more would-be physician scientists who are overburdened with clinical work while they try to do research, meeting with learned but unsympathetic PhDs on study sections who fail to grasp this disparate burden. But, in the final analysis, there should be a heck of a lot more investment in all kinds of researchers by our so called leader, the real villains in this piece. So…let me guess. There will be more money for MD/PhDs and more MD/PhDs getting their medical degrees paid for while not doing research in their future positions. I have yet to meet an MD/PhD that wants to do research. How about funding research for PhDs instead? pleased to meet you. just wanted to introduce my self to you as an MD/PhD who wants to do research and has detected the better part of the last 10 years (post training) doing so. Based on my recent observations, I would guess that a major contributing factor is the inability of very good postdocs to get research and research/education positions in academia. There are very few openings these last few years, perhaps due to the ongoing financial crunch and slow recovery. Balance in the workforce requires some amount of turnover each year, and that turnover just isn’t happening right now. This is not necessarily an NIH problem, but rather a broader problem with the US high-tech workforce. You needed a major report to figure this out?! The dollars for research have declined dramatically – why should doctors go into this field? Add that to the fact that practicing physicians make 2-3 times the salary of a research scientist, and it doesn’t take a rocket scientist to figure this one out…. It is even worse than you think. I assumed the role of division chief in a clinical department at my present institution 1 year ago, having not previously held an equivalent position previously. I view mentoring younger faculty as the single most important element of my job. The deck is stacked against physician-scientists. Clinical departments are focused on maximizing RVU production and strictly limiting unfunded research. I have a physician-scientist in my division who finally, after years of effort has gotten a small grant to support her research. Even with a supportive chair, it has been a struggle to protect her time for research and her support for research expenses beyond the award, even though the award doesn’t cover the costs of the project. She has great promise, but she may not survive as a physician-scientist. In the clinical arena, new systems of care penalize part-time clinicians, as such individuals are not as facile with EMRs as full time clinicians are. Moreover, clinical work spills over beyond clinic time to a greater degree than ever before, because many tasks have been added to physicians’ work. This eats into time that was previously available for research. In the research arena, the regulatory burden continues to increase. IRBs and IACUCs are more focused on technicalities than on the basic questions of “Will the study teach us something, is it ethical, and is it safe?” I understand that these bodies are being subjected to ever-greater scrutiny for their responsibility in exercising oversight on research, but the expectations have become unrealistic. This also eats into time that was previously available for research. With tighter pay lines and more individuals competing for a shrinking pool of resources, it is harder than ever for a part-time scientist to write a 5th percentile proposal. Moreover, there is little difference in my opinion between a 5th percentile proposal and a 15th percentile proposal, other than how receptive the reviewers were. I could go on at great length, but the above is my view from the trenches. Compelling report. I am less sanguine than you about the future of PSW, as I believe that the data show an actual decline in the number of PS who are entering the workforce each year. For the total number of PS to remain stable over time despite an increase in the average age of the workforce, there must be fewer “mature” scientists leaving the workforce than in the past while fewer newly minted PS are entering the workforce. Hence, the relative proportion of physicians who identify as PS is declining as is the actual number of new PS who are joining the workforce each year. This dynamic predicts that a certain decline in the total PSW is inevitable if we do not greatly increase the number of new PS who enter the workforce. I disagree with the expert report in one critical area: I believe that increasing the number of individual F32 grants will be less successful than increasing the number of T32 grants and T32 slots. It is onerous for a fellow just entering the lab to write an F32; at best this device can fund a second or third year research fellow, but cannot fund a first year fellow. By contrast, a T32 can fund a first year fellow and provides stability for three years of research funding. I believe that having to write grants as soon a fellow begins to contemplate research training discourages many fellows from a career in investigation. The full “Physician-Scientist Workforce Working Group Report” is good, as far as it goes, but two major factors do not seem to have been addressed: 1) the number of students admitted to medical schools has not increased since 1980*; 2) medical school admission committees screen out most of the very students who want physician-scientist careers. In the long run, one or both of these factors has to change to increase the number of physician-scientists. NIH could perhaps extend the “PSW Training Pipeline” (Figure 2.2 on page 8 in the report) to undergraduate or even high school student support, and call medical school admission committees to task. *Figure 2 in: Gordon, R. (2012). The vanishing physician scientist: a critical review and analysis. Accountability in Research 19(2), 89-113. Your graphics consistent with the general trends in Russia. Although, unfortunately, in Russia amounts less. It seems reasonable not to lose experienced staff. This dooms you to repeat the mistakes and limits the use of long-term experience. Not too wasteful? Everything should be in moderation. This seems like a willful disregard for the facts. Why in the world are we allowing trained PhDs leave science in droves while lamenting that there are no physician scientists. How long can the obvious answer befuddle NIH? There needs to be a scientist retraining program that created MDs from PhDs. That solves both problems since this is a subpopulation that is clearly interested in research and our tax dollars are already heavily invested in their training. I would be love to be involved in this program either as a participant or administrator. A “scientist physician” instead of a “physician scientist”….that’s a great idea! Gordon, R. (2012). The vanishing physician scientist: a critical review and analysis. Accountability in Research 19(2), 89-113. The bottom line is that there is a dilemma, and I think I am in agreement with most previous posts when I say that the proposed solutions are not good ones. I also do not believe that reducing funds for MD/PhDs is a proper solution. Increasing funding for PhDs, even those that are later trained to become clinicians, is not a solution. Whether an individual is trained as a combined MD/PhD or PhD-then-MD does not predict if they will stay in research. All of my colleagues in these programs are disenchanted by their future prospects in science purely due to the competitive nature of science today, which is largely fueled by the stagnant funding environment. There is a point where even an intense love of basic research will be overcome by crushing competition and the allure of an easier lifestyle in clinical practice. Why bang your head in worry for acquiring grants and pushing out competitive papers when you can live an relatively less stress-free, more stable life as a physician? As other have already stated, early F and K grants are but temporary band-aids. To KEEP physician-SCIENTISTS, we must continue their support in an environment that is not so discouraging. I believe we need to 1) maintain and support great mentors to properly train future physician-scientists, and 2) the government needs to ascertain how to improve the current distribution and amount of funds that are available for MD/PhDs as well as others. We don’t need tons of physcian scientists or basic scientists, we need passionate and dedicated scientists whether they are MDs, PhDs or MD/PhDs. The report does not acknowledge the effect that loan forgiveness (balance forgiven after 10 years of repayment) will have on the Loan Repayment Program. It is rapidly losing its ability to incentivize new medical school graduates, since paying down the balance will have very little impact on payments during residency and fellowship (when repayment is income-based) and none of their later years, when the balance will be forgiven. A medical student graduating in 2012 might have $250,000 of debt. If that individual pays 15% of his/her income (say $75K), that adds up to $12,500 per year. After 10 years (interest still accruing), s/he owes more than $150K, which is then forgiven. So what good is loan repayment to this person? I would suggest the name is Physician Scientist is changed. Physician has a clear connotation of doctor that treats humans. However, in the definition given above by Dr. Rockey it includes many other aspects, even veterinarians. Perhaps consider Medically-trained researcher or some other type of name. Of course physician scientists add a key element to the research equation: keeping the focus on delivering effective treatment/prevention to our patients. When you treat patients with serious illness it certainly motivates the physician scientist to keep the focus on the deliverables! The VA remains the best place to nurture a physician scientist’s career with formulas for release time from clinical duties, career development awards, and an in-agency Merit review system for funding that tries to even the playing field when competing with full time bench scientists. Of course there is little to no opportunity there for pediatricians and while women’s health is coming along its not a strong enough focus in the VA research portfolio. I hope the VA continues this role of developing the physician scientist and I am certain if you polled the 10,000 physician scientists and asked how they came to be physician scientists, you would find the VA research program played a very strong roll. That is to say the NIH did not help that much, as it lost its strong physician scientist programs of the 80’s and early 90’s. No wonder the population is aging! This complaints of the PhD scientists worrying that funds might be directed in this way seems a bit lame, with only 10,000 physician scientists in the pool, its still a small drop in the NIH bucket of funded investigators. A major problem is the 22% decrease in constant dollars in NIH funding since 2003. It appears that our US president and congress either do not understand or have little interest in medical research, as measured by a consistent lack of monitary response. The brain initiative appears to be money shuffling, and is unlikely to increase overall research. It may even do more harm than good by shifting funds away from current projects that do not match the idea of big science. We hear endless talk about infrastructure such as bridges, but medical research is the infrastructure that eventual treatments and cures for disease will be based on. What is the solution? 1) Keeping constant NIH funding at the inflation adjusted rate would be a modest start. 2) How about some criticism of the president and congress to at least maintain constant dollar adjusted funding. There is always the possibility of executive order to increase funding if there were pressure to do so. 3) There are far too many health scientists for the funds that are available. Training too many is just a waste of money and does not necessary lead to getting the best scientists. Many gifted potential scientists may go into other fields becasue they can see that there is unlikely to be sufficient money to carry out their research. 4) Training PhDs with postdoctoral experience and excellent publication records to MDs, as mentioned previously in the comments of others, would be a very cost effective way to create more scientist/physicians. How many would go into research? Probably the same percentage of physician/scientists that go into research. Unfortunately, this train PhD to MD approach has limited support becasue it would not contribute more graduate students and postdocs to carry out research at the low wages that support the current pyramid system of science. 5) Change the Claude Pepper law so that tenue ends at age 70 or 75. Then the medical schools could dismiss those over 70 or 75 who are collecting salaries and occupying space with limited or no research productivity, to make room for new scientists. Those scientists over 70 or 75 who were productive researchers could be maintained. There are no easy solutions, but the current approach is not working. Anyway you cut it, there are either too many scientists or too little money. Since money is unlikley to go up, then the number of scientists being trained should be greatly decreased and the funding for grants should be sufficient to pay those who have trained for years so that they can be hired as scientists rather than cast aside and replaced with less expenisve students and postdocs, which, unfortunately appears too often to be the current sad approach in the research community. I am not certain why there is pushback from PhD scientists to the clearly reduced numbers of physician-scientists. This report in no way disparages the strong work from PhD trained scientists but places value in the unique background training that a physician-scientist receives. To disregard the value of a physician scientist is ludicrous. The goal of this report is to highlight a loss of the best and brightest of the current and next generation to careers in science. To wit, by reviewing the GPA, class rank and achievements of the highest achieving young high school and college students, it is clear that many more of these young people choose medical school training than a PhD education. These are the brightest students, yet they are obviously not choosing science as a career. This is a much bigger concern to the health of our sick and ill of today and tomorrow than the competition between a PhD and an MD. From the perspective of the trainee, there are really only two issues relevant to this discussion: career opportunities – (i.e. will I be able to find an appropriate research position when my training is finished? ), and career longevity – (i.e. is there a reasonable chance I will still have my lab in 10+ years?). If the answer to either of these questions is no, then attempting to encourage physicians to pursue research careers, through whatever mechanism, is not only misguided but disingenuous. If, for whatever reason, the NIH and/or other powers that be feel that current numbers are inadequate for sustaining a robust biomedical work force (and I agree with this assessment) then the focus should not be the individual, but rather system wide, institutional, issues that deter and demoralize highly motivated physicians from choosing this career path. These individuals are generally quite smart and can see the landscape as well as (or perhaps better than) the PSW working group. I am a PhD physiologist who has been doing research for over 40 years, funded continuously by my own NIH grants. I have worked with physicians in this research for over 30 years. Close association with physicians has greatly enhanced our lab’s science, and made it more relevant to clinical problems. I could not have had my career without these MDs. However, most MDs trained in the past 30 years have had little research training (there are very notable exceptions). Medical school does not produce scientists, and grad school does not produce clinicians. In addition, MDs are torn from research by the opportunity to make a secure income by continuing part time in clinical practice, which presents immediate demands and rewards. Research funding is frighteningly difficult to depend on, and research presents a very delayed reward structure. I think the strength is to be found in close alliances between PhD scientists and MD collaborators — the NIH could encourage this. Here I am, a successful (6-12 papers per year, several in journals with IF > 10) young translational scientist with a PhD now considering non-academic career options due to the ridiculous funding situation, while the NIH contemplates throwing more money at clinical colleagues who produce a third of the publications and almost exclusively in journals with a quarter of the impact. Way to encourage young investigators, NIH. All because the fantasy of the “physician-scientist” sounds so good. Nevermind reality. Watching this issue for the 30 years since I obtained my PhD from an academic medical center (that actually really knew how to train excellent biomedical scientists) what strikes me is that we as a community has always had this whole issue backwards. Despite every effort the number of physicians engaged in basic science research has and will remain small. The selection process for medical students is unlikely to select for scientists. It is more likely that individuals that elect to get their PhD education at academic medical centers 1) want to be scientists engaged in research and 2) are already interested in pursuing research of clinical importance. Instead of morphing clinicians into researchers why not take full advantage of the individuals who are already planning to pursue exactly the kind of research we say we so desperately want and need? And perhaps engage clinicians in the research process by having them more comfortable with question generating, observational research, community data gathering,and in the communication process across stakeholders. This might actually have a side benefit – a biomedical research enterprise that is actually connected to biology and medicine instead of an artificial entity designed to produce papers and grant proposals but not progress. Glad to see proponents on both side of equation, PhDs and MDs should be considered integral part of any biomedical research enterprise. We should be complementary to one another, we become whole when PhDs and MDs sit together and discuss the disease from both unique perspectives. PhDs bring in wealth of information, technical capabilities and hands on experience with generation of reagents, cell lines, PDX animal model systems, methodologies, systems biology approach to tease out a disease manifestation, BUT what Physician-scientist brings to the table of team-science of trans-disciplinary approach is the insight of the disease progression from initiation to metatses during clinical mamangement of the actual patient care continuum. So, in essence to have a robust design of experiements, both physician-scientist and translational scientists need to put together their thinking caps and discuss science at collegial level on equal footing. I have witnessed the best outcome of this cooperation, collaboration and team-science among physician-scientist and basic-scientist for last three decades. We are two sides of the same coin, based on mutual respect for one another’s profession, we can do ground-breaking biomedical research that wil have profound impact in the early detection, prevention and cure of diseases. We both MDs and PhDs have same common noble altruistic goal, intent and purpose to do our best to improve the health and well being of our fellow human beings on global fronts. I am an MSTP grad. I just finished residency a year ago. My residency program had 4 MD/PhD’s in it. Of these, two will probably go into research careers, and two have decided to go into clinical practice. The two that will probably go into research careers were able to compete for foundation grants and extended dedicated research time during residency. Of the two that decided to go into clinical practice, one seemed to lose interest in research after an unpleasant and excessively long PhD experience, and the other seemed to also have lost interest in research as it was difficult to merge their research experience to the clinical specialty. They received little dedicated research time or mentoring during residency. I’ve noticed much attrition in the career track comes from the difficulty with maintaining the clinical/scientific dualism during residency and fellowship. I think having the opportunity to maintain research skills during this critical period is important. Most clinical training is now approaching 6 years (residency and fellowship). Combined with the last 2 years of medical school, the physician-scientist has a gap of 8 years when they are unable to do science. Couple that with an environment in which rewards are based on a clinically based value system and one can see how MD/PhD’s migrate towards clinical careers. It’s hard to stay motivated when your attendings have no interest in your scientific questions. Having a lab to call home, dedicated research time, and strong mentors in positions of power during this period would do much to motivate this population. Unfortunately, there doesn’t seem to be much support for the physician-scientist during the clinical training period in many specialties (although there are a few research oriented residencies). Research is to be done during one’s own time, of which there is often little. On the other hand, obtaining clinical training is vital, but I believe a balance can be achieved. Of course, having a good funding environment always helps, and I know that at least one of my MSTP classmates who would have stayed on the physician-scientist track if the award rates were better. I have read in other comments that perhaps it would be better to have MD and PhD’s as separate tracks entirely. From my own experience, they are different worlds, and the extra MD insight is valuable. When one starts a research project, how does one know that the goals, if successful, would be clinically useful? Are there other diseases or conditions that might be relevant? How do the aims fit with existing patient management in practice? That’s right we need more people who are as passionate infected as heroes of “The Big Bang Theory :D” series. Of course, at this point it’s a joke. But something like this is, at least for us in Europe at the moment on PhD studies. There are sometimes a persons, not by vocation and passion, but those who have completed a master’s thesis and have no idea what to do with life next. So they stay at PhD.. It’s kind of sad. I agree with all of the comments regarding why MD PhDs don’t stay in research if they pursue residency training as well. It is just so so hard, and getting harder every day. It’s not just the terrible NIH paylines, or the fact that you are getting pushed hard to earn more RVUs on the clinical end. It is the overwhelming burden of paperwork to cover regulations that newly crop up on both the clinical and research ends that is unbelievable! To the PhDs who are so worried that all their funding is being taken up by MD PhDs — well it isn’t. I know you harbor some grand illusions that your /your friends lack of success with getting funding is due to MD PhDs getting preferential funding but that is just not the case. Study sections are dominated by PhDs and the MD PhDs are held to the same standards, even if they work a full clinical load. To those who don’t think that MDs and MD PhDs don’t bring something to the research table–you’re wrong, and probably you have been talking with the wrong folks. Apply to NSF if you aren’t happy with the National Institutes of Health funding research by MDs and MD / PhDs. But really we should all be on the same team. Honestly the multiPI award is soon going to be the only way to get funded. As long as Medical Schools see physicians mainly as producers of clinical revenue this trend will continue to its logical conclusion. For the bean counters that have taken over academia today the time a physician spend on research and trying to get a grant is a “cost” of list clinical revenue. With todays funding percentiles it is almost certain that even a grant with its overhead will not end up compensating the institution for that loss. Next to be thrown under the bus: education – a very unprofitable and wasteful activity for a medical school. As an undergrad in Microbiology with a strong interest in pursuing a career in Naturopathic Medicine, I thought that having a ND/PhD was the way to go. But after reading this report and the helpful comments from all of the MD’s, PhD’s and MD/PhD, it is obvious that it is better to choose one or the other. I love both the research and clinical aspect of Medicine. But if I had to choose an emphasis on one, it would be clinical. I also know of some very successful partnerships between ND’s and PhD’s conducting clinical research and trials on Autism. As a student, finding this report was very helpful. It gives me hope that there is the opportunity to pursue Naturopathic Medicine and still be involved with meaning and groundbreaking research.